The first collection of night photographs from a masterful Midwest photographer. 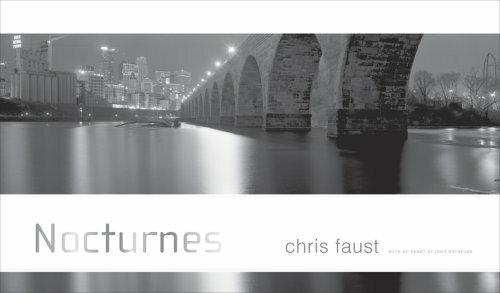 A prominent figure in the Twin Cities art scene, Chris Faust marks the essence of the changing Midwestern landscape by documenting common scenes in an uncommon way. Known for his spectacular panoramic work, Faust is also increasingly admired for his unique night photographs, where he quietly unveils a world we never noticed was there and when the darkest hours evoke a mood of mystery and surrealism. The palette of light and shadow heightens our senses by revealing the stillness and ambiguities of the landscape. Nocturnes, a beautiful collection of more than seventy tritone photographs, is a visual record of our world as few ever see it: during the nighttime hours. Emphasizing the passage of time as well as the necessity for change, the images reflect our disappearing rural terrain, abandoned urban streets, and aging industrial spaces, recalling aspects of our culture that are quickly fading into the past. With an affinity for certain old-world practices and tools, Faust works just with ambient light and uses no digital or electronic technology—only classic darkroom processing—allowing all the subtle textures and tones to emerge in his work. Faust’s photographs of the Midwest are shot in a panoramic format with wide, detailed images—spectacular in both their artistry and documentary impact.